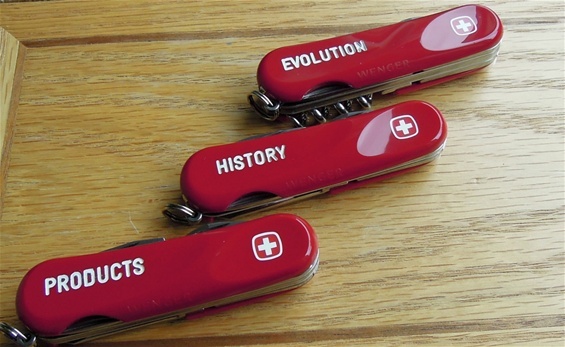 The Swiss Army knife today is a product of a very high-technology production. The development from the beginning until today reflects the development of the world and peoples interests. It is also a product that produces jobs and income. 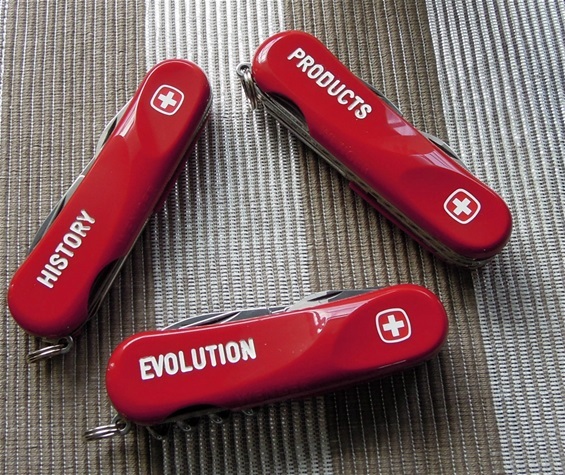 The Swiss Army Knife is also more than a product it is a world icon. The knife today can represent an incredible number of functions in one body. If we look upon a knife and its functions then we can immediately make an impression on what this knife can be used for. The original officer’s knife and the functions could fit many tasks at the time but it got its limitations today. It is not so that the SAK only changed to make the impression of tools that can be used by people. The truth is that it reflects the development in the world and technology + the factors mentioned above as a product for making jobs. The special impression and usefulness the original officer`s knife represented has been implemented in the modern knife as well. The modern SAK represents the origin and the development until today. The knife became an icon the day it was invented and continues to grow as a versatile tool into the future. Some models represent a wow factor in the sense that it got an incredible number of functions in one body. This I agree on because these are usually made for show purposes and not use. At the same time it does not represent a wow factor because all the individual functions on it was made or invented to be on the different SAK products made for use. The SAK development is also made for it to be able to function as a competitor on the world market. The most important development for users and factors is the precision, quality and functionality. The innovation is a very important factor in the development. As I see it we can divide the evolution philosophy on products itself into three parts depending on people’s philosophy of use. Some would prefer a knife with only the basic functions on and some would like to have more functions than needed just in case. The third philosophy is the persons that would decide very deeply or conducts research on what is the best SAK for me. There is also maybe a fourth category of users that just buy a SAK because it is a SAK. If we again look on the history of the knife then we very clearly can see the development of the sportsmen utility knives. This is very important on how the knife look today. There is for me a link between the officer’s knife philosophy and the sportsmen knives with utility development. We know from history that the use of more functions is smart because they can be assembled on different models to be able to fit a person’s special needs. The Evolution of a knife is not for show and it is really an important factor for the knife to be able to perform and follow the world we live in. The development can also be divided into sub factors with the design and functionality. That a special product is eye-pleasing and nice looking is important. At the same time it must be able to have the best functionality. The special thing with a SAK is that the nice design and functionality only strengthen themselves together and does not have any negative result. We know from history that some functions and development changes happen because new production methods arrives that make it possible to use. It is important for the makers of the Swiss Army Knives to in some cases be ahead of the time we live in. The product or function can then be able to survive for a long time. It is a very complex development on the functions. Because the factories implement the origin into the product makes it able to survive. The development of the key functions from the officers and sportsman knives has only changed slightly. The introduction of new tools and the development of them is a far more complex thing. The versatile development of the SAK and the impression of the tools is complex. The first Officers knife had the special affect to be able to reach out to an incredible numbers of people. There are two parts that is important, number 1 is the development for the world we live in and the second is to uphold the versatile presence. Some would say this is a wow factor. I do not agree and I will explain. To use many functions on a knife reaches out to many people in the sense that it looks cool and it is a wow impression for many. But if we study the history then the main idea behind any function is the use. This means that it could be used in a situation and hence it is important. It is special to say that a SAK made the versatile presence happen because knives with many functions were made a long time before the Swiss did. The development of the SAK is very different than the old European pocket-knives with many functions. All over the world are collectors and enthusiasts of the products and we are very many today. We are a bit different than the regular users or the persons that buy the product. We do not compete in who is the best collectors or enthusiast because we all have a part of it. I am interested in all aspects of the SAK and it is a big task to try and fulfill my interest. It is an everlasting hobby. I am also completely independent in my hobby. Because of the SAK history and the products we can have a small or extra-large hobby. We are very different from the regular persons around the world that have knife-knowledge. We are very enthusiastic about the Swiss Brand for a reason. We do not limit ourselves by the regular world collector systems. A product is what it is in some cases but it is much more when you look closer on it and why it is made. The key for me to try and understand the SAK is to mix the history, evolution and products. It is very important to combine these 3 factors with the two sides that is the factory politics and the collector/enthusiast side. Still today the two main categories of knives with functions are the Soldier knives for the world and the Officer`s style. Both are available on the civilian market today and they are made to be a tool for all other tasks than combat. It is obvious because this main driving force behind the products combined with sportsman knives are generally what a SAK is. I have explained much in my article about how complex it is. What is less known is the Officer`s and the Soldier knife mixing together and become new categories and new innovations. This again is an example on how the world changes and how the demands change. This is not new in history and it does show what development is. It does show how complex the development is in history and what caused the changes. The Wenger personalized and sportsman presentation series are an example on the 3 main factors. In 1977 when Wenger worked hard for a part of the US market they could present some knives that did fit the demand of the market and present the Wenger philosophy on knives. Swiss Army Knives for sportsmen or a specific interest. This we can see very clear in the late 1970s. With the icons on the scales you enhance the versatile presence and one may identify the knife better with your philosophy. The use of icons in the scales had already been done before but it is presented on a larger scale with the two series. I have explained some on this before and how the SAK in many cases are sportsmen knives with a SAK construction. If we look on the development in the US market we can see that the demand and development goes hand in hand. People could request new functions but also new colors. To open new markets with fashion purposes require different colors or specific knives. As the technology and production methods develop then new products can be made. The SAK can be made to fit much more than the two Wenger series could. New colors, materials and special printing on the scales can make it possible for almost any task. In many cases people would say that it looks like the makers have just produced and produced. We must remember that it is very complex to just say so. It is a result of an incredible number of factors but the 3 main factors combined with company philosophies and market strategies are the key here. The products that Wenger presented in the late 1970s are very good and they are nice to collect. This was in a time the modern Swiss Army Knife really entered. The 3 main factors can just as well be used for any Swiss Army Knife related interests in any form. In the different pages on sakhome.com you can find information regarding knife safety. I have discussed the development on the functions and knives. I have mentioned some before on what I will talk some more on here. Quality, functionality, comfort, sharpness and that it is modern. The evolution on the knives is done because of many factors. That a knife is modern is very important for the safety. Product development and the quality are important because it will ensure that a product keep up with the world and make it versatile enough. Sometimes some older categories of knives may be just as functional or versatile today. If we look upon the demand and the modern world then i can very clearly see the signs of a different and more demanding public.